If any of you frowned when they read about my dinner at Le Buffet, don't be disappointed. That was more out of convenience rather than looking for some gastronomic delight. It worked as we were tired and really didn't want to venture far. However, that would all change the next day as one of my uncle's friends picked us up and helped show us around. 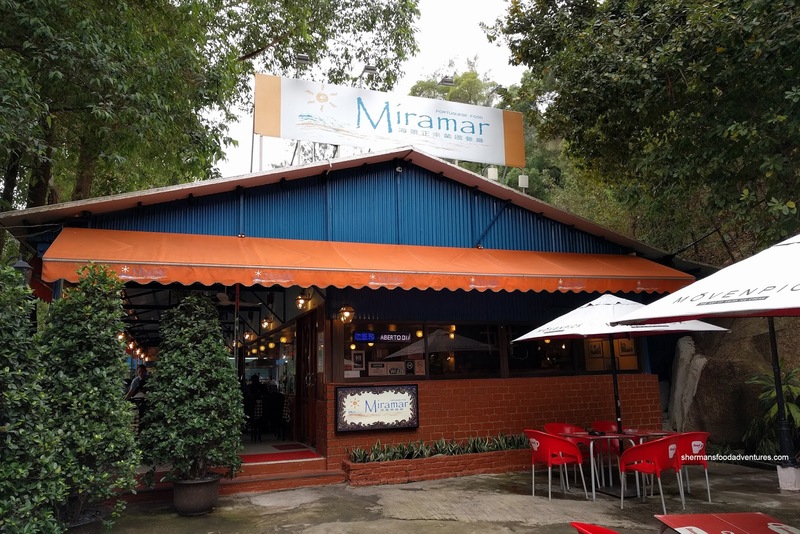 In fact, he took us directly to a popular Portuguese eatery far off the beaten path - Miramar Restaurant right on the water. 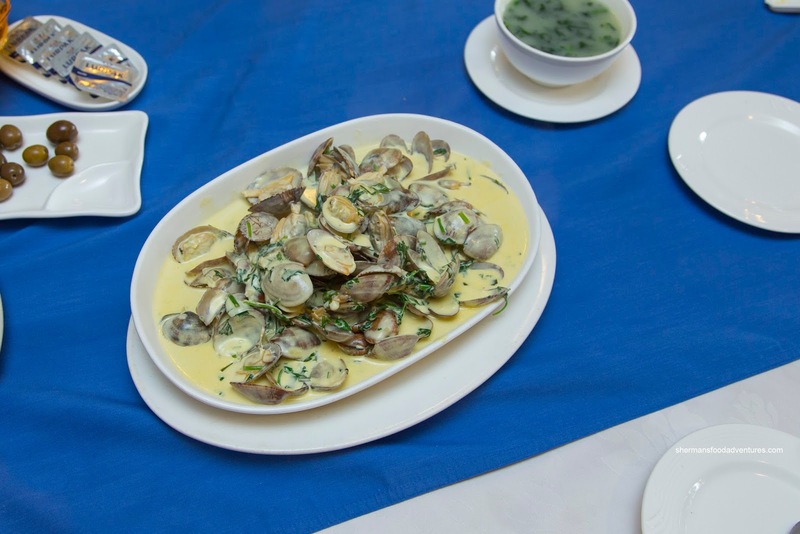 For our first dish, we went straight for one of their most popular in the Chef Style Clams prepared in a creamy white wine sauce. As simple as this may have appeared, this was addictive. The buttery and plump clams were briny and sweet on their own, but the silky and thick cream sauce added a certain mild flavour without hindering the natural flavour of the clams. Equally delicious, the Octopus Salad featured tender octopus that still retained an appealing chewiness. 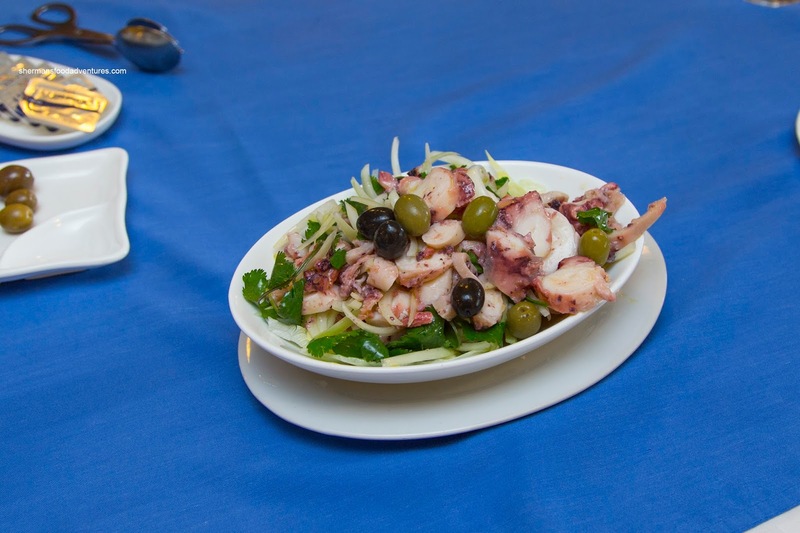 There was a natural sweetness and taste of the sea that was accented by a balanced sweetness and acidity. 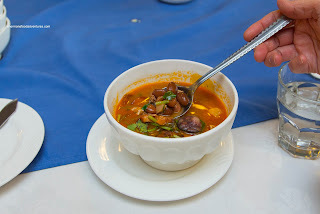 The olives provided a layer of saltiness as well as some brininess. 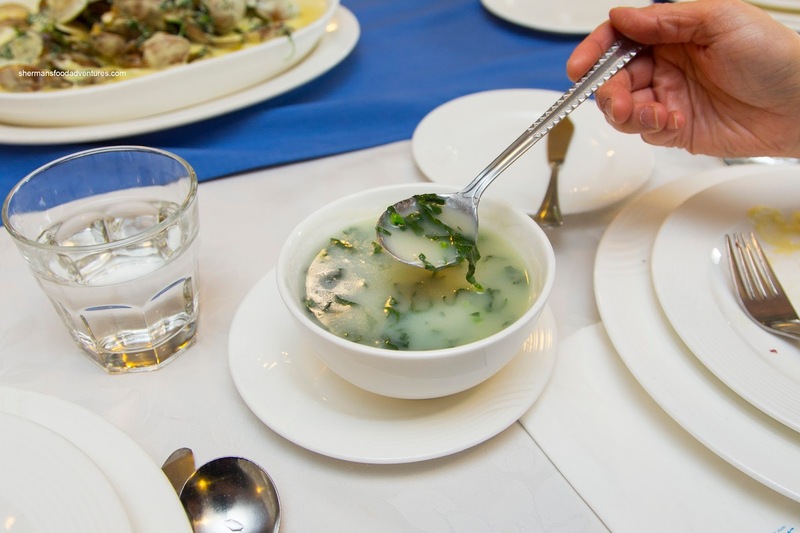 We then moved onto a traditional Portuguese soup in the Caldo Verde consisting of cabbage (looked like kale) and sausage. Due to the large amount of dissolved potato, the soup was starchy and somewhat thick. There was the brightness of the greens while there was some smokiness, tartness and spiciness from the sausage. Next, we had the Fueoada a Transmontana (Portuguese Bean Stew) with red beans and pork ham. This was hearty due to the tender beans and generous amount of sausage and pork. There was a light smokiness to go with considerable meatiness of the stewing liquid. Onto another "appetizer" as it seemed like we were eating non-stop, we had the Croquettes. 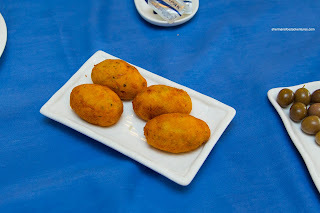 These were made with beef, but the texture wasn't very beefy, rather it was pasty and rather salty. With that being said, it wasn't dense though. Outside, the breading was rather light and stay crispy throughout. It was also easy on the grease. 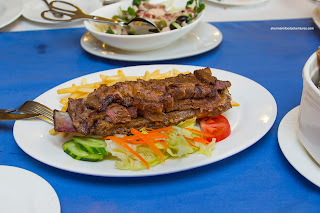 Sliced, but served on the bone, the Costoletao de Vaca Grelhado (Grilled Beef Rib) was done medium and that allowed the meat to remain tender and succulent. In classic rib meat fashion, there was a nice rebound texture as well. I found the briny seasoning offered up a certain umaminess which was rather appealing. We weren't done with the stews as we had 2 more including the Carne de Porco a Alentenjana com ameijoas e batatas frita aos quadrados (Pork with Clams). This was definitely interesting as the combination of briny clam juice met the meatiness of pork (also the tangy veggies). I was on the fence whether it was an impactful dish or not. 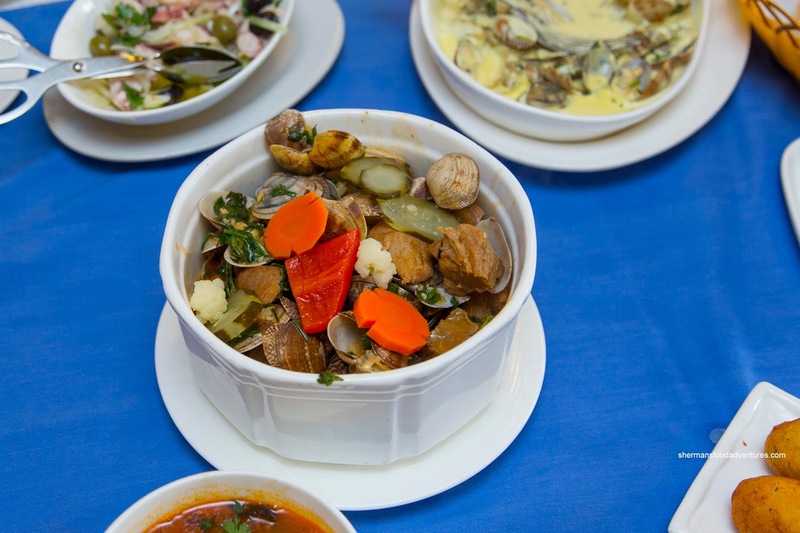 But whatever the case, I liked the buttery clams, yet the pork was a bit chewy. 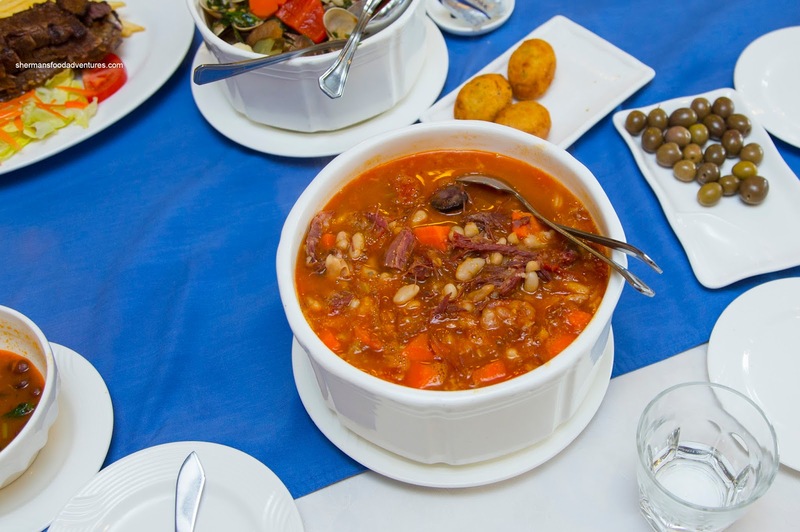 I enjoyed the next stew very much as it was Tripe with White Beans (Dobrada com Feijao Branco). The tripe was appealingly gamy and tender with a chew while the beans were nicely textured being just soft enough. There was definitely depth-of-flavour with a umami savouriness. 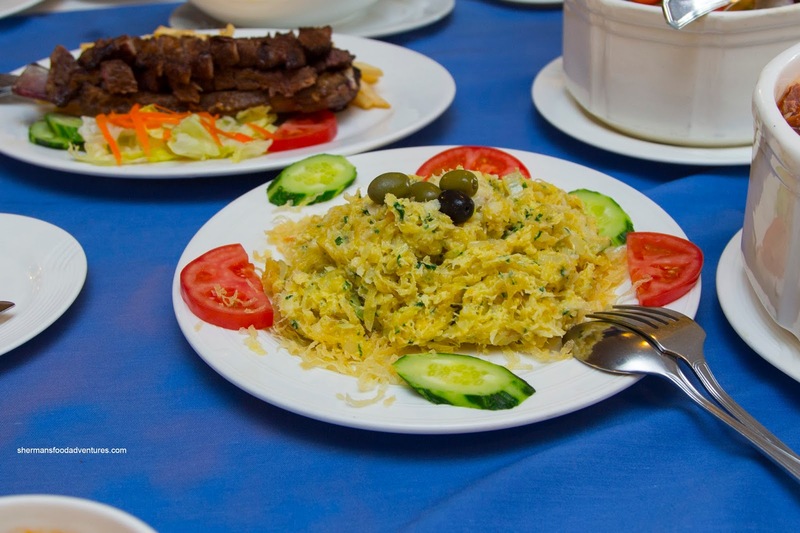 Our last item was the Bacalhau a Bras or scrambled eggs, salt cod and potatoes. As expected, the dish was salty, yet not in a bad way. The textures were soft and in addition to the saltiness, there was some sweetness from the onions. As you can see, there was more than enough food for 10 people, let alone 6 with 2 kids. However, this was a good sampling of the enormous menu at Miramar. Something definitely different for us and away from the touristy areas.